When Walt Disney tinkered with his attractions at Disneyland to improve them and give visitors something new to experience, he called it "plussing." In 2015, Six Flags Magic Mountain plussed its classic Colossus roller coaster—big time. The ride was the world’s tallest and fastest wooden coaster when it opened in 1978 and was a beloved fixture at the park. In recent years, however, it had become excessively rough and was, ahem, coasting on its reputation. Six Flags converted it into a steel-wood hybrid coaster, made significant changes to its layout, and gave it a new name: Twisted Colossus. The result? There are only a handful of coasters that merit our top rating of five stars. Twisted Colossus now joins them. Track length: About 5000 ft.
What makes the ride so drool-worthy? In our playbook, a truly great coaster should have some decent pops of airtime, that delirious out-of-your seat sensation. Twisted Colossus dishes out a nonstop barrage of airtime, catapulting passengers skyward with abandon. Prerequisite number two for a coaster to make it into the five-star club: It should give a mostly smooth ride. That's a tall order for a ride designed to navigate a twisted course at breakneck speeds, and many fail miserably. TC, however, is among the smoothest coasters we've ever experienced. It makes its way through almost 5,000 feet of track and delivers almost four minutes of wild fun (its unusually long ride is another great attribute) with nary a hiccup. Given its wacky layout and the crazy elements its includes, TC's rock-solid smoothness almost defies logic. A top-notch coaster should also feature a great first drop (those that are not launched and include traditional lift hills anyway). Guess what? TC has two great drops. Both are a satisfying 128 feet at a hairy 80 degrees (that's 10 degrees short of straight down for the mathematically challenged). It's a heckuva way to kick off a ride. But TC throws another drop into the middle of its course. Double the pleasure, double the fuuuuuuuuuuuuuuun. A great coaster should have a layout that strings together a compelling set of elements. It's all about the pacing. Like a great piece of music, coaster designers need to compose their rides so that the highs, the lows, the interludes, and all of the other moments meld together to form harmonic convergence. TC has wonderful pacing. A slow ride up the lift hill is followed by a scream-inducing first drop and transitions into some incredible bouts of airtime. Then there is a zero-G roll that sends riders twisting 360 degrees. Yes, the new-age version of the wooden Colossus now includes inversions. With its steel track (but not just any steel track—more about that later) and its modified coaster trains, TC is able to turn passengers upside down with grace and characteristic smoothness. After all the craziness of the first half of the ride, TC takes a breather before climbing the second lift hill. Then all hell breaks loose again with more giddy airtime. About halfway through the second part of the ride, the train enters into the "Top Gun Stall" and flips upside down for a few seconds that seem like an eternity (in a good way, though). Four minutes after their journey began, blissed-out passengers return to the station. There is one feature about TC that gives us pause and almost knocked the ride down to 4.5 stars. The original Colossus was a twin-track racing coaster. Two trains left the station at the same time and raced against one another on competing tracks. The new TC is one, extra-long, continuous track. But it is still supposed to include a racing-like interactive experience. In theory, as one train is making its way toward the second lift hill, a second train is supposed to be dispatched from the station so that the two trains can climb the side-by-side lift hills at about the same time. TC's computer controls are designed to sync up the two trains. When two trains are in sync, one train inverts over the other. The Top Gun Stall is supposed to feature one train hanging upside down for a few moments and racing on top of the other right-side-up racing train. That would be an eye-popping feature for passengers in both trains. There is also a High Five moment that is supposed to turn the two racing trains towards each other so that riders in opposing trains could almost give high fives to one another. During our preview rides, we didn't see any racing trains. They were never in sync. In fairness, the new ride had not yet officially opened. But it appears it would be difficult to sync up the trains. In order for it to work, the ride operators would have to unload and load a full train in less than the two minutes it takes for the first train to complete the first half of the course. The ride ops could put the mid-course train in a holding pattern before it scales the second lift hill until the other train catches up to it. Perhaps a better solution (if it's feasible) would be to hold trains just beyond the loading station. That way, a train could be unloading and loading while a train just outside the station could be in place to be dispatched and timed to meet up with the mid-course train. When it is fully operational, TC will have four trains at its disposal. Here's hoping the park will be able to figure out how to make the racing aspect work. If it can't get the trains racing, is that enough of a five-star deal breaker? Perhaps, but even without the racing aspect, TC is still an incredible ride. Let's review. Smooth ride? Check. Great layout and pacing? Check. Wonderful first drop? Check (and check again). Airtime? Major check. That might be enough to put TC in the upper echelon of coasters. But the fact that it is a next-gen version of a classic ride cements its status. By the way, the original Colossus partly earned its classic badge by appearing in the first National Lampoon's Vacation movie. You can read about its starring role in the TripSavvy feature, "What's the Deal with Walley World?" Six Flags saved Colossus from the wrecking ball, and honored the old coot by giving it a magnificent makeover. Longtime fans will be delighted to discover that the original ride's DNA is still there, and its heart and soul remain intact. But it's been given a new lease on life with some slick, new body parts and a renewed sense of vitality. Amusement parks have long been a curious blend of the old and the new. There are antique carousels and other longstanding rides that generations of fans love to revisit. Parks temper the nostalgia, however, by offering the latest, greatest technology and innovative ride concepts. Twisted Colossus embodies the odd dichotomy in one attraction. It's an old favorite that inspires nostalgia, yet it is filled with wondrous, new features that inspire delight. It is a colossal coaster achievement. Here's a look at the hybrid wood-steel coaster's steel track. Unlike a conventional tubular steel coaster, TC has a flat I-beam-shaped track. The side guide wheels fit into the channel of the "I." The track may have something to do with TC's wonderful ride. The coaster's designer, Rocky Mountain Construction, definitely has something—well, nearly everything—to do with the wonderful ride. The innovative ride designer calls its patented track "IBox" or "Iron Horse." This is the fifth old wooden coaster on which it has performed its voodoo, and so far it is batting a thousand. Two rides in Texas, the New Texas Giant at Six Flags Over Texas and Iron Rattler at Six Flags Fiesta Texas have nabbed spectacular reviews (including TreipSavvy’s). Rocky Mountain converted a coaster in Mexico, and In 2015, it also made over the Cyclone at Six Flags New England. It is now known as Wicked Cyclone. 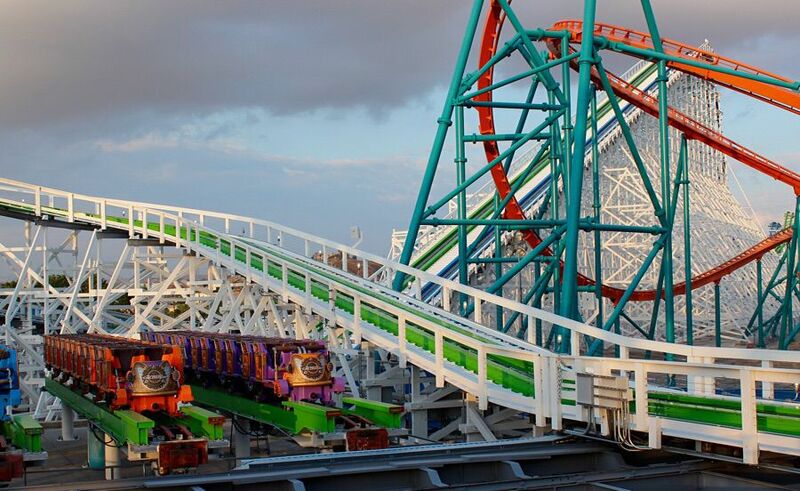 See how they all compare in our rundown of the best hybrid wooden and steel coasters. TriSavvy’s Arthur Levine was among the first to ride Twisted Colossus with Carter Evans, a reporter with CBS This Morning. He also appeared in a segment about the ride on the national news program. Could You Handle Lex Luthor: Drop of Doom at Six Flags?